Tripp Lite's 25 foot DVI Dual Link TMDS cable delivers the high performance, high bandwidth needed for today's digital video displays. While many monitors only support a 5 meter (16ft) DVI cable, simply adding a Tripp Lite B120-000 DVI Extender will guarantee full digital signal strength at any length up to 150ft. Gold plated contacts ensure excellent conductivity, while double shielding (foil and braid) provides maximum EMI/RFI protection. Use in conjunction with DVI video cards that are specified as Dual or Single Link. 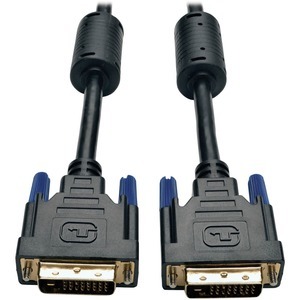 Both DVI connectors are molded, have integral strain relief for long life reliability, and ferrite collars to drain off extraneous electrical interference.